Ferrari has taken the wraps off its most powerful front-engine production car ever, the 812 Superfast, at the 2017 Geneva Motor Show. 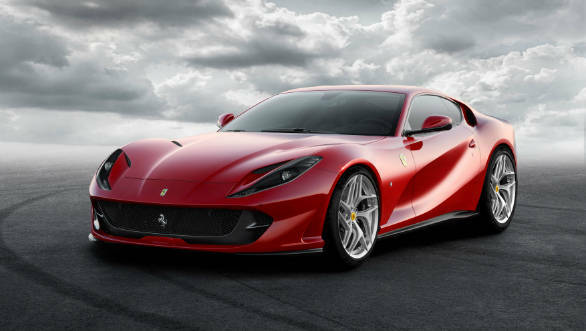 A replacement for the mental F12 Berlinetta, the 812 Superfast features a brand new, 6.5-litre, naturally aspirated V12 motor that develops a whopping 800PS at 8,500 rpm and 718Nm at 7,000rpm. 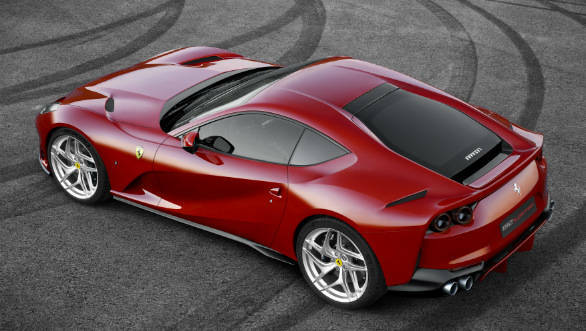 That's a significant rise above the F12berlinetta's figures - 6.3-litre V12 developing 731PS and 688Nm. The F12tdf's figures, however, are pretty close at 769PS and 705Nm of torque. To put things in perspective, the Ferrari La Ferrari's internal combustion motor produces almost similar power and torque as the 812 Superfast. 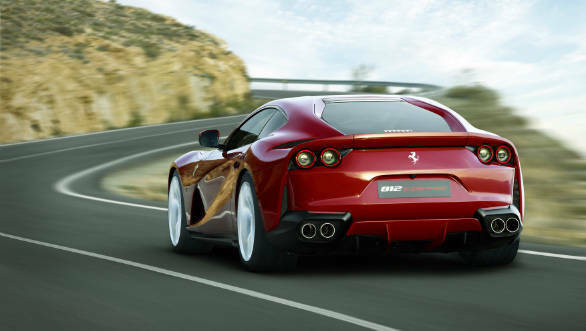 Ferrari claims the 812 can race from 0 to 100kmph in 2.9 seconds and has a top speed of 340kmph. Those are pretty impressive numbers for a car that's, in essence, a GT or grand tourer. But that's not all that defines the new Ferrari. The company has lavished the best of its technical and aero expertise in developing the 812 Superfast. While the styling may seem like an evolution of the F12berlinetta and F12tdf, the 812 features numerous cuts, swoops and channels across its body work that makes it the most aero-efficient V12 Ferrari sportscar ever. The huge grille upfront is what Ferrari calls the aero cluster which also houses an air duct to cool the brakes. The bumper has fins that channel air into a duct that directs air to the underbody, thereby reducing drag. The duct, however, is only operational at speeds above 180kmph. Then there are vanes on the bumper that guide the air around the sides of the car, improving aerodynamics. The scoops on the bonnet channel air through the wheel well that then exits from the vents in the fenders, thereby increasing downforce. A similar function is also provided by the air scoops above the rear wheel. The underbody also has a pretty complex underbody that's again designed to improve downforce. At the rear, there's an integrated spoiler for improved downforce and an active diffuser with flaps that move to either provide added downforce or reduce drag. The mid-front mounted V12 motor in the 812 superfast is mated to a 7-speed dual-clutch F1 transmission with an E-diff. Ferrari says the new gearbox upshifts 30 per cent faster and downshifts 40 per cent faster than the gearbox in the previous car. The 812 is also the first Ferrari to get Electronic Power Steering (EPS) which Ferrari says allows for incorporation of a new generation of vehicle controls. These include the second generation of Ferrari's Virtual Short Wheelbase, which is rear-wheel steering in Ferrari speak. Ferrari says this improves agility and makes the steering respond quicker to inputs. The 812 also gets the fifth-generation Slide Slip Control which, as the name suggest, allows the driver to drift around a corner, with the assurance that the electronic nanny will save the car in case things get a bit out of hand. In addition to these suite of electronic aids, Ferrari has introduced the Ferrari Peak Performance (FPP) and Ferrari Power Oversteer (FPO) system. The former, essentially, informs the driver that the car is at the limit of its grip in a corner by an increase in steering torque. FPO comes into effect when powering out of corners. It increases steering torque and hence feedback which helps the driver control the car during oversteer. The interiors are crafted to appear sophisticated yet luxurious. There's a mix of carbon fibre and leather around the cabin that looks good, and as is the case with any Ferrari, customisation options will be numerous. Ferrari will also offer an optional telemetry system derived from the LaFerrari's. There's a 12-speaker high-end audio system that owners can choose, but none of that can beat the glorious soundtrack of a naturally aspirated Ferrari V12.